Angela Peeks is an Instructor of Biology at SAU. She received her B.A. in Biology with a minor in Chemistry from Ouachita Baptist University in 2004. Mrs. Peeks went on to complete her M.S. in Molecular Biology at the University of Wyoming (2009), after which she was hired as a research professional at the University of Georgia in the Department of Infectious Diseases. Mrs. Peeks has also taught General Biology labs at Central Wyoming College and Microbiology at Truett-McConnell College. 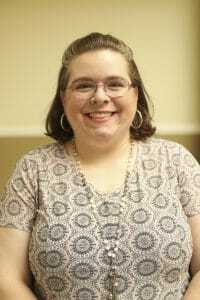 She later became an Adjunct Biology Instructor at SAU while teaching full-time at Magnolia Public Schools and completing her Master’s in Teaching degree in 2015. Mrs. Peeks teaches Introduction to Biology, Principles of Biology Lab, Microbiology for Nursing, and Microbiology for Nursing Labs.